Screw conveyer is used to loading and transfer up power or small granular products to continuously feed up Auger filler or other type hoppers. 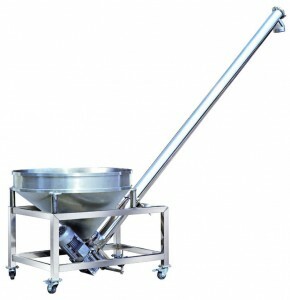 Products application: rice, salt, sugar, any powder product as well Machine made at highly sanitary design with full stainless steel structure, easy cleaning and back-up free which excellent choice for Food and Pharmaceutical industry. Voltage AC 220V, 1 phase, 50/60 Hz.AC 380V, 3 phase, 50/60 Hz.